This works well with frozen sweetcorn as well as canned and fresh. To make it vegan just use a vegan alternative to butter - I used Flora Dairy Free. I couldn't find plain sev so used Cofresh Bombay Mix from Morrisons (UK) and this was a fantastic addition to the dish. Really tasty, use the sev / Bombay mix as it really adds another dimension to the finished dish - we had this with the Baked Onion Bhajis on page 28 of this book along with some naan (sorry cheated and bought that!). This is such an easy recipe to do and you can make it even more healthy by cutting down on the oil for frying the onions and using a little water. Cook the onions on low with a little oil and a tablespoon or so of water until soft and then take the lid off and pick up the heat to give them a little colour. It's a very tasty recipe and very easy to prep in advance to finish off when you are ready to eat. We had this with the Blackened Sweetcorn Chaat from page 26. Make a half recipe. One kilo of onions won't fit in my largest pan! Pretty good but the batter was really dry, leading to a pasty interior. It was so thick it was more of paste that had to be scraped forcefully off the spoon onto the pan, but I stuck with it, as is, just to be faithful to the recipe the first time around. Next time add more water to achieve a texture that can be called a batter (even if thick) rather than dough. At least twice as much. Lovely filling that is different to what you would have had in a samose before. The instructions on how to fold these, altough seemingly clear turned out to be a bit of a disaster. I just defaulted to the square shaped pea and corn parcels I made out of cinnamon kitchen and that worked well. Time to watch some online videos and practice the art of samosa making. This is bonkers good, perfect crispy yet creamy potatoes, sweet dates and tamarind, tangy yogurt and spicy and crisp topping. Ate solo but would be perfect alongside bone in lamb loin chops. Sauce-use regular soy. Filling: use a touch more soy and salt. Subbed tofu for paneer and only used 100 grams, but added a bit more carrots and cabbage. Was about twice as much filling as necessary. Was delicious, but dough wasn't really standout. Try store bought wonton wrappers. Froze half and cooked from frozen without defrosting. Worked perfectly following regular cooking directions. Dough texture may have actually improved. This is absolutely delicious, the combination of ginger, mint, dill and the tarka added at the end gives a real burst of bright and zingy flavor. Just perfect. This was good but next time I'd definitely use pre-cooked beetroot to drastically shorten cooking time. Used soy yoghurt and left out chilli. Could pre-make coconut yoghurt sauce. Would make again. A really delicious dish and very easy to throw together on a weeknight (especially if you prepare the spice mix in advance). I wasn't sure what Sodha meant by "red chili powder" so I used a mix of cayenne and paprika (1 to 2 ratio) and that made it spicy, but not deathly. Love the tang from the vinegar, as with all vindaloos. The sweet potatoes added a different (obviously sweeter) note and while I did enjoy the dish, I might prefer it with meat, as in a traditional variation. Or.... maybe a mix? Regardless, the sauce is lovely and I highly recommend trying it! I made this with red kuri squash and we really liked it. The sauce was delicious over rice. Really delicious sauce that can work for a variety of other dishes as well. 9-28-2018 The sauce is so delicious, I kept stealing spoonfuls of it. The squash gets a little overdone when cooked per directions. Will reduce cooking time in the future. This sauce is amazing and would be very versatile with lots of other veggies. I made half quantities of the sauce but I didn't have as much coriander as the recipe states (it's a lot). I just used 1 standard supermarket pack (stalks too) and it worked fine. If you cook the sauce for too long it will lose its vibrant green but it will still taste great. To add some extra protein I popped some chickpeas on the baking tray half way through cooking the butternut, plus I shredded some spinach and folded it through the rice for even more veggie goodness. I found this recipe to be strangely fussy in comparison to a lot of others of hers I've tried. I'm not sure why you need a separate pan to fry the mushrooms in, for example. The result was also not very flavorful, even once I mixed in the salt. Would not repeat. We did not love this. The flavor was just okay and it left the biggest mess in the pan I've ever seen. With so many delicious Indian recipes for okra and for potatoes, I see no reason to revisit this one. I have been wanting to make this recipe since I bought this book. We made it today and didn't love it. My husband, who made it, thinks it would work better with the proper ratio of sauce/broccoli. We had a little over a pound and there was a ton of sauce on each floret. We extended the cooking time by five minutes and while the broccoli cooked, the sauce stayed goopy and white. The flavor was okay but much better in areas where it had browned. I'm not sure I'm willing to try this again but think it does have potential. 12-23-2017 This is a mild, delicate curry, but delicious. Loved the idea of shredding the sprouts, I'd never done that before. Great for using up Christmas leftovers. This was nice (toddler ate!) but flavours quite subtle, be careful what you serve with, can easily be overwhelmed by more powerful flavours. A dry dish that might need a wet accompaniment. Quick and easy. This was pretty good. It needed a bit more salt. I especially liked the little charred bits. Others in my family didn't like it as much as I did. This is terribly easy to make and really delicious. Who knew? The coconut thoran is magical. This is good but very dry, so it should be eaten with a dal/curry/some kind of sauce. I didn't find that the potatoes took too long to cook but I did slice them a little smaller, I think depending on the size of your new potatoes you may need to adjust slices/size. Everybody liked this, especially the kids. Next time I would fry the potatoes longer until they are starting to crisp (which takes longer than the ten minutes indicated in the recipe) before adding water. I also think the dish needs more salt. We ate it with dal, naan, yogurt and tomato achar. The last two ingredients were brilliant with the potatoes! Wish I'd read the notes! Lovely but took much longer to cook potato than stated, probably wouldn't try again on a weeknight. However delicious and a good way to get greens into children. Delicious! Used spinach instead of kale. I was so excited by this but ultimately a bit let down. Full disclosure: I didn't have black mustard seeds so used yellow and skipped the garlic, otherwise followed it fairly faithfully. Was a bit bemused by the instruction to use a lidded pan because there weren't any additional instructions to cover at any point. Cooked the tomatoes for a lot longer than instructed and they never reduced to a dry paste, although they did thicken up. Ran out of time/patience in the end. Final result was nice but not wow, although husband seemed keener than I was. Spices maybe a bit mild for my taste. On the plus side, a pretty healthy meal. More likely to try an alternative recipe in the future though. This was decent, and kids liked it because it wasn't particularly spicy, but like the other poster I was ultimately let down. I also found that the tomatoes needed longer to reduce. I put the lid on so they cooked down and then took it off for the last few minutes so they thickened but they never developed the rich, dark red in the picture. I reduced the chili by half, as I usually do, because I am feeding children. I served this with tomato achar made by Brooklyn Delhi (!!) and yogurt and that complimented the food very well. The mustard sauce was much milder than I expected. I liked this a lot and it is a very quick dish. I served over rice. Put the rice on before starting. Delicious, although a little faffy. It’s a good thing she uses some weights, as the recipe calls for four eggplants, weighing in at 2 1/4 lb, so perhaps she is using Asian eggplant. My single eggplant weighed 1 1/4 lb, which was fine for my half recipe. My eggplant took longer than the 10 minutes called for in the recipe. I’m glad I didn’t add the sugar, as the dish had a slight sweetness without it. While I liked this, it was a bit bland in the spice department. The deggi mirch gave it a slight after-kick, but that’s about it. I love eggplant, and I love peas, so that was just fine with me. Didn't wow me as much as some of the recipes in the book, although it's quick and easy to make and doesn't need many ingredients. I substituted a can of tomatoes for fresh. It seemed like too much aubergine for the sauce, but they reduced down with cooking. Really easy and tasty curry that doesn't need a lot of ingredients or time to make and won't break the bank. Lovely with some kind of flatbread (Naan, chapatti etc). This was very good. There is a similar recipe in her first book but this one has cauliflower, which makes it even better! We had it with the Daily Dal (from Made in India) and naan. Delicious! This was a big hit with my family. I was concerned that there wouldn't be enough tomato sauce but in the end it turned out well. I made it with the basmati rice from Made in India (I have recently discovered and now exclusively use this recipe for basmati) and with yogurt and a selection of chutneys and pickles and it was a lovely meal. I anticipate making this often. Really tasty and quick and easy to put together. The only fiddly bit is the paneer. I used canned tomatoes. And didn't find any mangetouts so just doubled the green beans. Everyone loved it. This was a great main using spring vegetables. I used sugar snap peas rather than snow peas. Next time, put the water on to boil first. This says it makes 4 servings, but these are really big portions. I made half a recipe and this worked well. Matar paneer is one of my favourites but I've never tried to make before. This wasn't exactly as I remembered but very good. No good for M because of cheese but husband approved. A few changes: swapped garlic for an onion and used tinned tomatoes. Also used tenderstem broccoli instead of mangetout because that's what we had. Other green veg would work too - sugarsnap and edamame would be nice. The paneer was harder to cook than I expected - stuck to frying pan, would need longer than stated to get the lovely golden crust in the picture. Otherwise this is actually fairly straightforward and doable in the week. Spices all go in at once so could be measured out together. Remember that for the full recipe (4 people) would need 2 packs of paneer. Portions for two were just right for hungry appetites! Agree with stockholm28 get the water on earlier! This was delicious, and very simple. Everything worked well together, and there was a lovely balance of sweet, sour, salt and heat. We halved the recipe for two people, a serious error.... we could have easily eaten the whole thing! I made this twice. First with a mango that felt hard as a rock but turned out to be too ripe. This salad was tasty very annoying to prepare, as it is very hard to hold a slippery peeled mango and cut strips from it. The second time I managed to get an under ripe mango. This was much easier to prepare, but after adding the sugar and lime as per the recipe, it softened, got sweeter, and tasted exactly the same as the first version, so flavor wise, a ripe mango is fine, just very tricky to work with. Both recipes taste like mango salsa to me, good, but not really exciting. Good side dish. We served it with asian-style grilled prawns. Especially liked the shredded coconut. Very tasty, used cashews which I bashed after caramelising rather than flaked almonds and they were delicious. I halved the recipe though as I thought a whole fennel bulb (I only had huge ones) and 3 apples would be a bit too much with a couple of other sides (inc Meera's kachumber) to accompany a whole large tandoori chicken for 4. We really liked this. It takes a long time to cook but is not very labor intensive. I loved the rich, creamy sauce and the toasted almonds added a lovely texture and flavor. Very tasty. I didn’t use quite as much paneer as the recipe called for, still great. Fantastic recipe. The smell of the baking pumpkin is divine. My first time cooking pumpkin, as it is something I didn't grow up with I normally sub with butternut. I used a small sweet pumpkin and it was just delicious. Cooked the black eyed beans in the pressure cooker for 10 min after a 4 hour soak, they were probably just a little too soft. Cooked with tamarind and caramelized rice which went brilliantly. Will be making this again, for sure! Update: we had some from the freezer yesterday - this dish does not freeze that well, the pumpkin was way too mushy and the flavour a little off. Next time I’ll make just enough for two! This was very good. I used kombocha squash. I peeled it and cut it in one inch squares so it would roast faster and so it would be easier for the children to eat. I only used one chile and didn't slit it so there wouldn't be much heat. I added the curry leaf tarka at the end but just the flavored oil (I discarded the leaves). I served it with plain basmati and the cucumber/mint raita she recommends. The tart raita was a perfect compliment to the rich curry. Really delicious curry, it went spectacularly well with tamarind and caramelized red onion rice and the cucumber and mint raita from the same book (as suggested). I had trouble not eating all the roasted squash (used buttercup), and I'll use the garam masala coating on its own sometime for sure. I only used 1 chile (seeds removed), in hopes the preschooler would deign to eat the curry, but I should have just used them all as I wanted more spice and he was only into naan, as per usual. Subbed pressure-cooked black-eyed peas and home-canned tomatoes, but otherwise followed the directions. I did add the tarka, with leaves, and loved the added flavor. This is okay. We didn't like it nearly as much as her daily dal, which is fabulous. Very tasty, but I wish it were less work. I originally wanted to make it in the instant pot, but then I realized you had to add different vegetables in five minute increments. Maybe next time I'll throw it all in anyway and not worry about if certain vegetables are too soft. I like spicy food, but if you are more sensitive to spice, then I would start with much less and taste as you go. I made this x3 as had eggplant and butternut squash to use up and it made a huge pot. I used sugar snap peas instead of green beans - I think you could vary the vegetables according to what you have, This will be great to freeze in individual portions for winter dinners or lunches. I didn't have curry leaves or tamarind paste so the flavor wasn't as authentic but it still tasted pretty good. I read some reviews of the version of this on NYT Cooking that recommended doubling the spices and coconut, so I did that and I think that was really key to giving it flavor. I also upped the salt a bit and added lime zest to the kale along with the lime juice. I thought this was quite good with those changes. The lime is really important for brightening up the flavors. An easy, fairly tasty dal. Just needed to cook the dal a bit longer than specified, about an hour. At 45 minutes, mine was a bit al dente. This was good but not a stand out. I would repeat but I have SO many other dal dishes to try first. Tweaked this recipe a bit to use the cooking technique from her coconut rice (boil and drain, then steam) and it worked fine, but wasn't a revelation. Proportioms of fruit and nuts were pretty good, though half of my dates didn't make it in to the rice because after soaking they became so soft they became a sticky ball when I tried to fold them into the rice. (Was using Iranian dates, which are quite soft anyway. ) Apricot's texture was not to my taste when contrasted with rice. Even the kid started to pick around them after a few bites. 11-30-2018 After reading through the recipe, I chose not to follow the instructions on the rice cooking. Ms. Sodha likes to use the pasta method, and I do not. I washed the rice, soaked it, drained it, and let it dry out again in the strainer for a while. I sautéed the rice in oil, then transferred to a tin that fits in my Instant Pot, added water, and cooked, covered, in the IP using the pot-in-pot method. Meanwhile, on the stove, I've toasted my sesame seeds. I fried the curry leaves, then added the red onion and cumin and cooked it down. Seasoned with black pepper, red chile, and tamarind as called for. When the rice was done, I folded it into this mixture on the stove. I sprinkled the sesame seeds on at the end, rather than mixing in. This rice was good, but a bit sweeter than I wanted from the caramelized onion. I think with the appropriate dish, it could be a great accompaniment, for example if the dish had a lot of tart flavors to balance the sweetness, or a lot of heat. Lovely Indian rice. Could easily sub an instant rice at the end if you are feeling lazy or for a quick weeknight dinner - you can't normally do that with other rices, particularly from Raganvan Iyer's 660 curries. I found it a pain to try and fish out the sesame seeds at the beginning and in the end left some in, they didn't seem to burn so I might leave the whole lot in next time I make this. Really liked this, wish I'd read Vinetomato's note first, that's what I'd do next time. Doable for weeknight. Very flavorful rice. I appreciated her cooking method of making the rice separately, then adding in the onion mixture. I was able to cook brown basmati in the rice cooker (my preference for make-ahead ease) and then add the rest without having to tweak the recipe. Would make again! This was a very nice, tasty dish. It dirtied several pots and took a bit of work (frying several batches of eggplant) but the resulting dish was very nice (and kid-friendly). I knew this would not taste like the uttapams that I am accustomed to, as this is not fermented, and it contains eggs, but I love savory pancakes and fritters so I approached this with an open mind, hoping to like this for what it is. Unfortunately I found the dough heavy and stodgy, and the topping was fussy, dirtying extra dishes but no tastier than a raw diced veggie topping that just gets browned with the pancake. I started with the rack about 1/3 of the way down to avoid the issue that others had. My breads puffed a bit, but not much. I baked for exactly 5 minutes. I think the were a bit underdone, but they did stay soft. I followed the instructions exactly in terms of size and shape (weighed the dough and measured width with a tape measure) and I think they were too thick. They were a bit heavy and more pita like than naan like. I probably will not repeat, but if I did, I would try rolling them much thinner. I'm torn on this recipe. It was quite easy to put together, with good flavor, but I didn't feel that the baking instructions worked out quite right. You're told to put an oven rack to the top of the oven and bake on a thin baking tray from there. My naans, though, poofed up enough that they touched the top heat coils, which made burnt lines across the tops, so I'd try at a lower level. I also wonder if a pizza stone heated up might give a better browned bottom, as my bottoms were quite pale and anemic looking compared to the tops, even having pre-heated the thin baking pan. So... worth trying but perhaps look at a few other naan recipes for better baking instructions. Following up to say that the leftovers froze and reheated beautifully! Just be sure to separate them with some parchment or wax paper to avoid them sticking together in the freezer. Very nice, like a Swedish fika bun. Husband thought they were a little dry and bready. It may be they need a bit more butter in the dough, or it could be because I needed to add extra flour to get the dough to come together. (I used defrosted frozen bananas which released a lot of liquid, making the dough quite wet.) Try with non frozen bananas next time. Also try frying! I second Lepa's note: good cucumber raita, and we ate it all, but not my favorite. This was good with the squash/black eye pea curry but it's not my favorite cucumber raita. Very weak. Double the tea bags. Love the grated ginger. Makes a nice spicy chai. Following on from her bestselling Made in India, Meera Sodha reveals a whole new side of Indian food that is fresh, delicious and quick to make at home. These vegetable-based recipes are proper feel good food, and full of flavour. 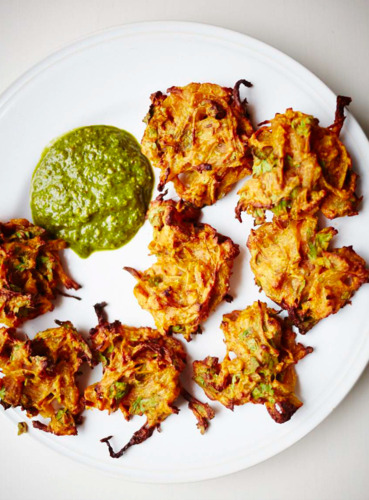 Here are surprising recipes for every day made using easy to find ingredients: mushroom and walnut samosas, oven-baked onion bhajis and beetroot and paneer kebabs. There are familiar and classic Indian recipes like dals, curries and pickles, alongside less familiar ones using fresh seasonal British ingredients, like Brussels sprout thoran, Gardeners' Question Time pilau and green beans with cashew nuts and coconut. And then there are showstoppers such as daily dosas with coconut potatoes, roasted cauliflower korma, sticky mango paneer skewers, wild mushroom upma and lime pickle rice with roast squash and red onion. To finish, there's a chapter of luscious puddings like salted peanut and jaggery kulfi alongside carrot halwa and pistachio cake. 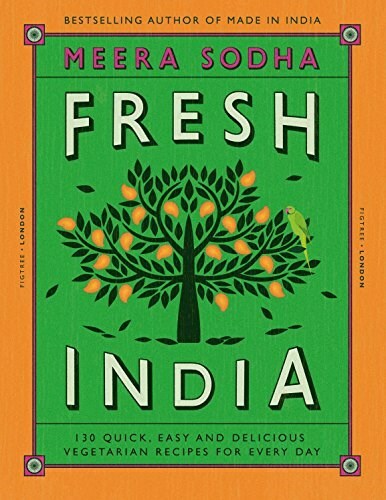 Whether you are vegetarian, want to eat more vegetables or just want to make great, modern Indian food, this is the book for you.